Hawking's analysis of particle creation by black holes is extended by explicitly obtaining the expression for the quantum mechanical state vector ψ which results from particle creation starting from the vacuum during gravitational collapse. (Hawking calculated only the expected number of particles in each mode for this state.) We first discuss the quantum field theory of a Hermitian scalar field in an external potential or in a curved but asymptotically flat spacetime with no horizon present. 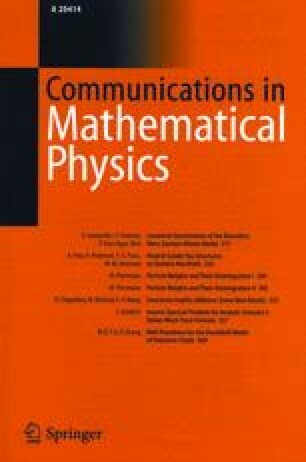 In agreement with previously known results, we find that we are led to a unique quantum scattering theory which is completely well behaved mathematically provided a certain condition is satisfied by the operators which describe the scattering of classical positive frequency solutions. In terms of these operators we derive the expression for the state vector describing particle creation from the vacuum, and we prove that S-matrix is unitary. Making the necessary modification for the case when a horizon is present, we apply this theory for a massless Hermitian scalar field to get the state vector describing the steady state emission at late times for particle creation during gravitational collapse to a Schwarzschild black hole. There is some ambiguity in the theory in this case arising from freedom involved in defining what one means by “positive frequency” at the future event horizon. However, it is proven that the expression for the density matrix formed from ψ describing the emission of particles to infinity is independent of this choice, and thus unambiguous predictions for the results of all possible measurements at infinity are obtained. We find that the state vector describing particle creation from the vacuum decomposes into a simple product of state vectors for each individual mode. The density matrix describing emission of particles to infinity by this particle creation process is found to be identical to that of black body emission. Thus, black hole emission agrees in complete detail (i.e., not only in expected number of particles) with black body emission. Supported in part by the National Science Foundation under grant MPS 74-17456 to the University of Chicago.